MSR WindBurner Hanging Kit. Make cooking logistics the last thing you need to worry about with this convenient hanging kit for your WindBurner personal stove system. 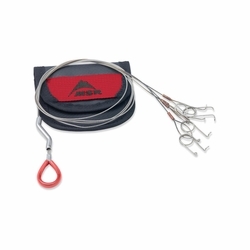 Ideal for climbing, mountaineering, ski touring and snowshoeing, this lightweight and durable cable system supports the stove base and features a sliding tensioner to secure your WindBurner pot while offering unobstructed access.